Marshall Sahlins—globally renowned ethnographer, Polynesian historian, and the Charles F. Grey Distinguished Service Professor of Anthropology (Emeritus) at the University of Chicago—has had quite a series of weeks. First came notice from the French Ministry of Culture, helmed by Frédéric Mitterand: Sahlins has been named a Chevalier des Arts et des Letters (Knight in the Order of Arts and Letters), an honorary position that commends artists, scholars, and others who have contributed “to the enrichment of French culture.” In addition, Sahlins is set to receive not one—but, two—honorary doctorates, from the Sorbonne and the London School of Economics. In addition, the Sorbonne will host a daylong conference on Monday, November 14, 2011, in celebration of Sahlins and his work, featuring contributions from sociologists, anthropologists, and philosophers from around the world. The author of numerous books (an assortment of which have been translated into French, including The Western Illusion of Human Nature), Sahlins is also the executive publisher of Prickly Paradigm Press. Among those books of Sahlins published by the University of Chicago Press are Culture and Practical Reason, winner of the Gordon J. Laing Prize; How Natives “Think”: About Captain Cook, For Example; Islands of History; Apologies to Thucydides: Understanding . . . This week brought The Black Power Mixtape to Chicago, though the film was previously released in early September to audiences in Los Angeles and New York. A documentary pieced together by filmmaker Goran Hugo Olsson from hundreds of reels of 16-mm interview footage produced by Swedish television journalists from 1967 to 1975, The Black Power Mixtape interlaces contemporary audio commentary revisting the Movement with many clips either unseen since they first aired in Europe, or lost to network archives. Organized chronologically by year, the film documents the rise of Black Power, from Stokely Carmichael’s earliest post-SNCC speeches and the founding of the Black Panther Party’s Free Breakfast Program to TV Guide’s (a publication owned by Richard Nixon’s then Ambassador to the United Kingdom, Walter Annenberg) critique of Scandinavian television’s “negative” portrayal of American society, eventually trailing off into more-or-less vernacular pieces on Harlem bookstores and drug-treatment culture. To watch the movement’s rhetorical development and the increasing exile, imprisonment, and death of its leaders alongside the community’s—and nation’s—growing disillusionment with the Vietnam War, Nixon administration politics, and urban poverty, is a fascinating exercise in the nuances of discrimination and endemic societal problems. To watch all of this alongside a sometimes sympathetic, . . .
Marjorie Perloff is the kind of critic who doesn’t require an introduction. From her pathbreaking work on the experimental inheritances of modernist poetics to her championing of outsider approaches, both on and off the page, she has earned her moniker as grand dame of the avant garde. This past month alone saw Perloff reach two additional milestones, which came commingled under festive circumstances: a celebration of her eightieth birthday at the thusly inaugurated First Convention of the Chinese/American Association for Poetry and Poetics in Wuhan, China. Perloff abroad seems to have much in combine with the stateside prowess we’ve come to admire. Joined by pomo poetry’s jester-magician Charles Bernstein, Perloff lectured on how she became a critic, and engaged with topics ranging from Duchamp’s Readymades to Ginsberg’s Howl. On her return to American shores, Perloff was greeted with an incisive piece from the Los Angeles Review of Books on “Criticism of Criticism of Criticism,” where Joseph Campana engaged with issues of legacy and cultural visibility for four of our most celebrated (and occasionally, maligned!) literary critics, locating Perloff in the company of Helen Vendler, Harold Bloom, and Marjorie Garber. As Campana put it: It’s hard not to get caught up . . .
Wednesday . . . the Slough of Despond of the week. Couldn’t we all use a pick-me-up? Could you make do with a pick-up instead? The taxi type, that is. 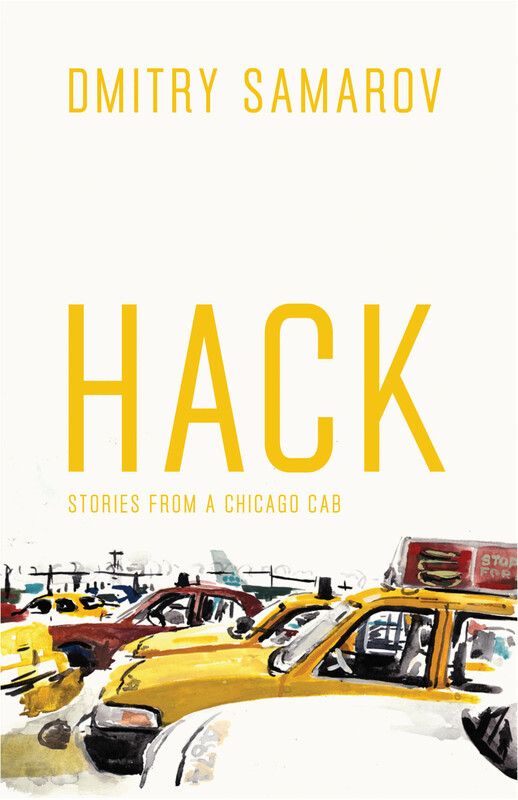 This week, Dmitry Samarov’s Hack: Stories from a Chicago Cab rolls out of the garage and flips on its ON DUTY light. Presenting tales originally written for Samarov’s ongoing blog, the book offers a cabbie’s-eye tour of Chicago, traveling its late-night streets fare by fare, revealing the city and its people at their most vulnerable, open, and unguarded. In his introduction, Samarov writes “Cabdrivers catch people at the most revealing moments—not when they have their game faces on, but with their guard down, unable to pretend,” and in his brief sketches of passengers, unusual conversations, and strange events, he gives us a privileged glimpse into those fleeting interactions that reveal so much about our fellow citizens’ hopes, dreams, and secret pains. Happy, clueless tourists on their way in from O’Hare; Clark Street drunks staggering out of Friday night and into Saturday morning; Cubs fans spilling from Wrigley after a win (or, more likely, a loss); the deserted streets of a lonely Christmas behind the wheel—Samarov brings his gentle, humane appreciation . . .